I love when serendipity, season, and whim dictate the contents of a recipe. A cooking demo for a farm-to-table event and whatever happened to be available at the vegetable stands one hot day in July prompted this combination, which I don’t believe I would ever have come up with myself. The ingredients cost 25 dollars and made a very large stockpot full of soup. The quantities are of course entirely variable, and you should, given the spirit of the recipe, use whatever you happen to find in an unusual farmer’s market. The dump-and-boil method here works. Make a small soup pasta by hand with the flour and eggs—gnochetti are perfect, formed with two little ridged paddles. Just cover the beans with water and then boil until tender, about 20 to 30 minutes. Add the rest of the water. Dump in all the other ingredients. Boil until you stop. Serve. It’s really spicy and sour and although it seems to suggest Italy in the pasta and Mexico in the ingredients, the final soup could really come from Africa, Southeast Asia, or just about anywhere else in the world. 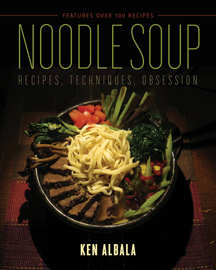 Read more in Noodle Soup: Recipes, Techniques, Obsession by Ken Albala!